I love this stuff. You can start this while housebound in a snowstorm. While caring for sick kiddos. While sitting around in your pj's and just not wanting to go out. No trip to the store required. No special equipment or supplies. That's my favorite kind of cooking. Or in this case baking. All you have to do to get this going is have a little patience and set a trap for wild beasties. In this case, the beasties you want are wild yeast. The trap is a little flour and water mixed in a jar and set in a warm place. Once you've captured them (you'll need patience like any hunter), all you'll need after that is more flour, salt and sugar. Give yourself an oven and baking sheet, and you'll be brilliant. It's so easy! And a bonus - this makes a rockin' cool science project for the kiddos. You've got three steps - making a starter, keeping and proofing the starter, and baking the bread. Let's roll. A starter is simply a trap.You're the hunter, but a very lazy one. 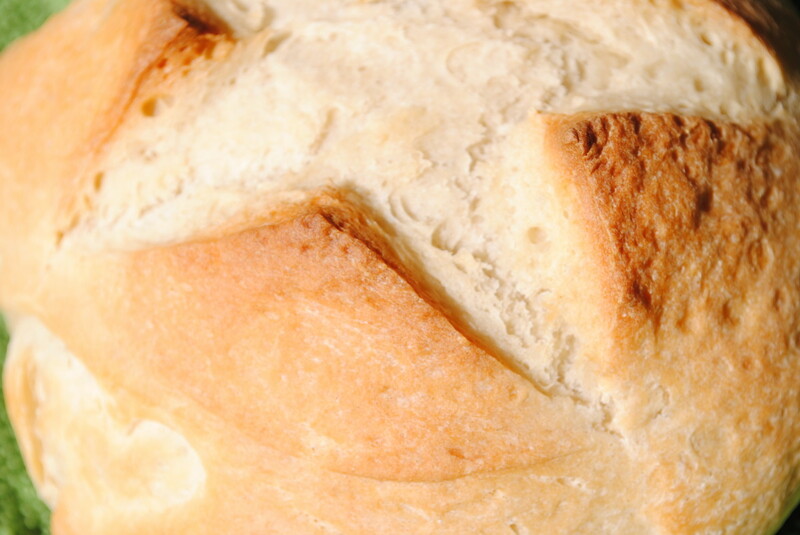 You're setting a trap for wild yeast, that will grow and make your bread rise. Think of looking for tiny little food fairies that you'll catch and keep in a jar, like lightning bugs. But instead, these will live in a jar in your fridge, complete with holes poked in the lid. You'll feed them, and in return, they'll give you bread. Just like magic! Ok? Here's all you do. Get a glass or plastic jar. My favorite is a small Mason jar - I use them for all kinds of things. Make sure the jar is squeaky clean, and place one cup of flour and one cup of warm water in it. The magic number for sourdough bread and starters is 100F. Don't ever let the starter get over this temperature and you'll be fine. Mix the flour and water well - in fancy cooking terms this is called a 'slurry', but you won't be using this slurry to thicken gravy. You'll find a warm spot to stash it in - I like my oven, turned off but with the light on. Just don't forget it's in there and turn the oven on - you'll kill your poor little fairies. They can take the cold, but don't like heat at all. Next, check your fairy trap once a day. You're looking for a layer of foamy bubbles on top. It's also going to begin to smell like sourdough bread, and it may get puffy too. The bubbles and the aroma are the keys though.This can take up to a week. When I lived near Seattle it took almost ten days. Here in Tennessee it took only two days. 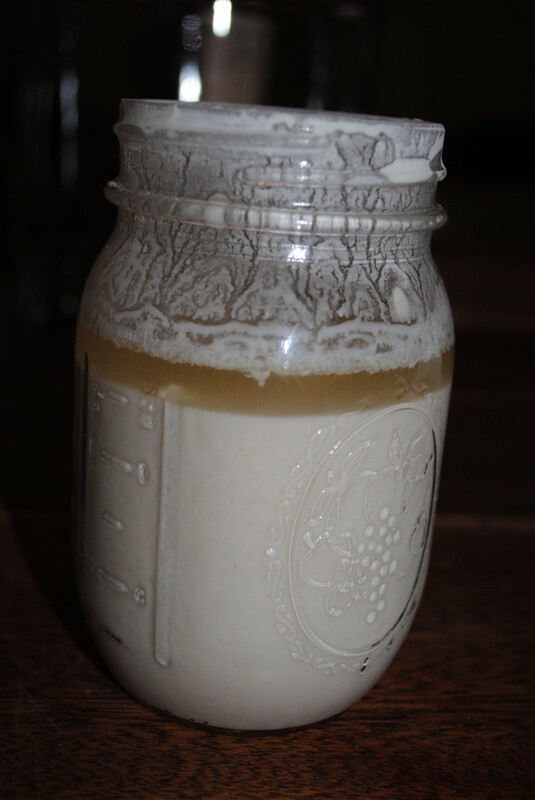 Be patient.You may find that a weird looking watery layer forms on top of your starter - this is all right. It's called hooch. Like hooch from the liquor store, it contains alcohol, but it's not anything you want to ingest. Keep it for the fairies. Stir it back in. 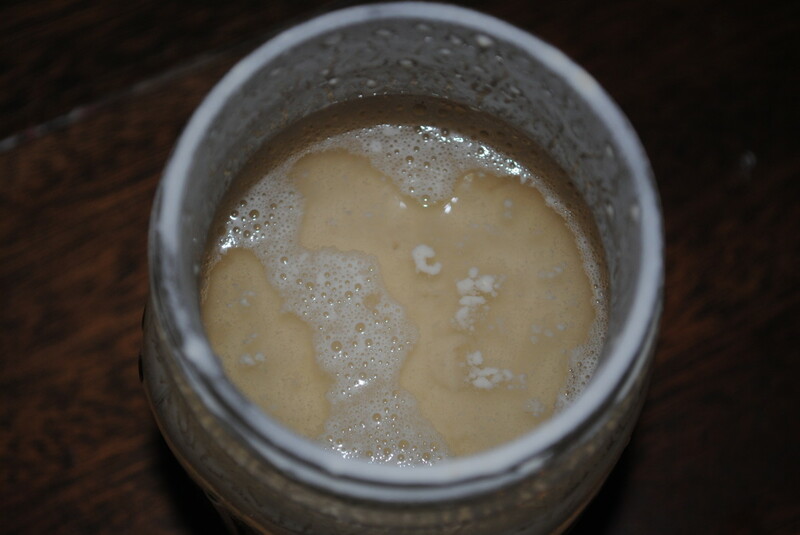 One note - when this particular batch of starter first began to give off the aroma, I noticed it at about 6:00pm at night (the one in pictures in this article). 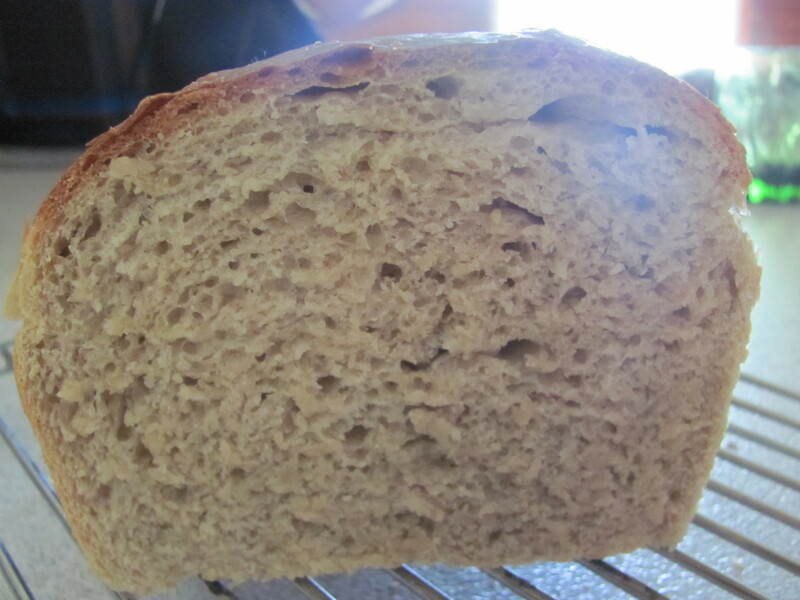 It was sour, and foamy, but didn't smell like sourdough. It was rather icky, to tell the truth and I wondered if maybe I'd caught something strange. A pixie maybe, instead of a fairy. 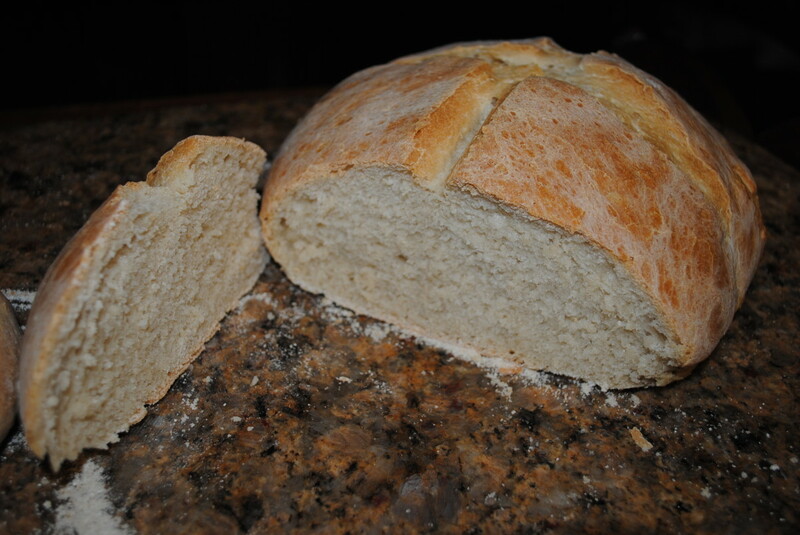 I fed it, left it alone, and by the next morning the sourdough aroma was distinct. While you're waiting, once a day, stir the starter well and feed it. To do this pour off half of your starter. Put a fresh 1/3 to 1/2 cup of flour, and a fresh warm 1/3 to 1/2 cup of water. Stir it well, stick it back in it's warm place, and wait another day. Once you get the bubbles and fragrance, you've done it! You are a Master Hunter! You've caught the food fairies who will gift you with bread in exchange for food! You've done what few people today can claim - you've captured the wild yeast! Pound yourself on the chest and yell "ugh!". Don't allow the starter to ever get above 100F. Use glass or plastic - like real fairies, these don't like metal. Keep your storage jar squeaky clean. Look for bubbles and the sourdough bread aroma. Feed it daily until you catch the fairies, then once a week. Fresh starter - nothing happening here. 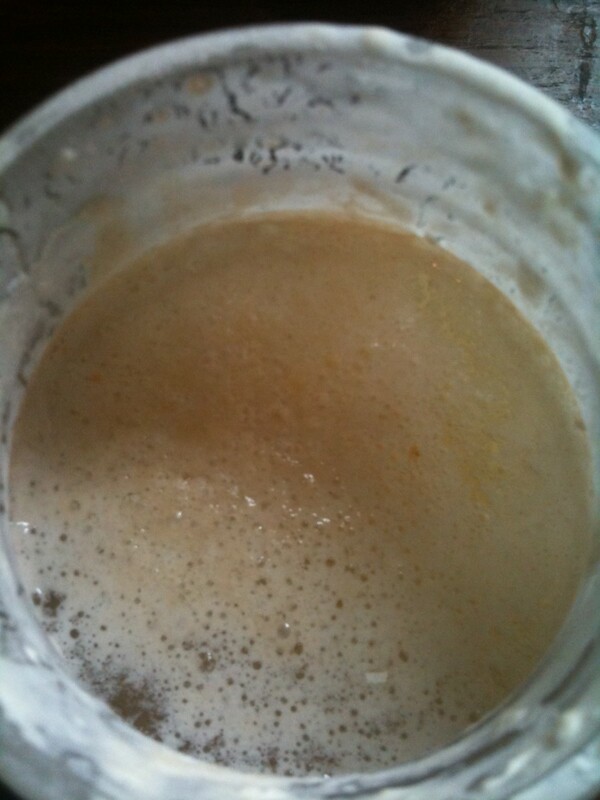 The starter has just captured the first beasties - there is the beginning of the foam, and a faint sour smell. Look! It's Hooch! Ok - not anything fun. You just stir this back in. It will show bubbles and smell really good - just like sourdough! Be patient - it could take a bit. Proofing just means you're giving yeast a chance to warm up and get ready to make your bread happen. 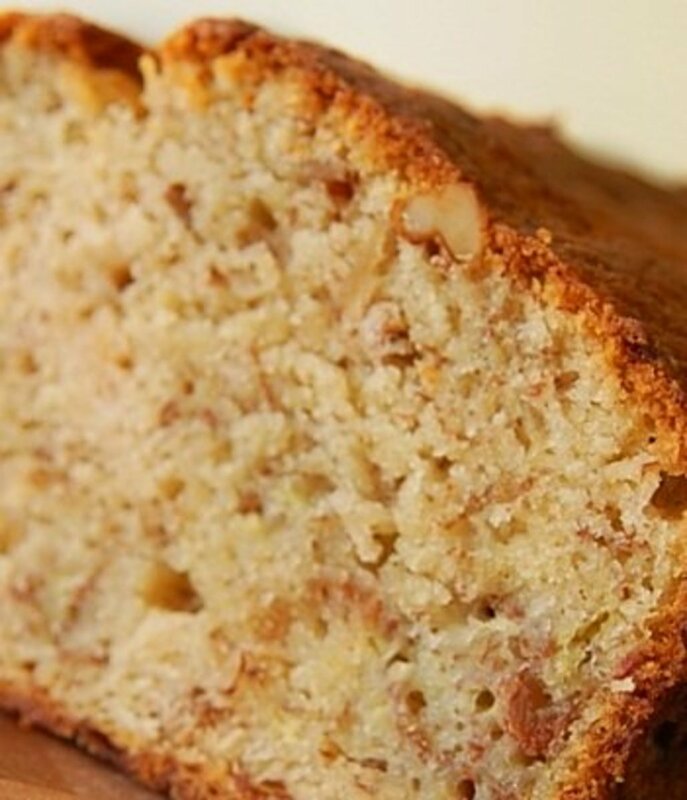 A sponge is simply the fermented warm batter you're going to make. Take the starter out and place it in a glass bowl. Plastic is all right too - but don't use metal. Sourdough yeasts don't like it for some reason. While you're proofing the sponge, make sure you scrub the jar out well before you stash a starter back in it. Skip this step and you'll find you've caught other nasty little beasties that will make your starter do bad, bad things. So keep it clean. Add a cup of flour and a cup of warm water to the bowl with the starter. Stir it well, stick it in a warm place and leave it alone. Again, I use my oven with just the light on. 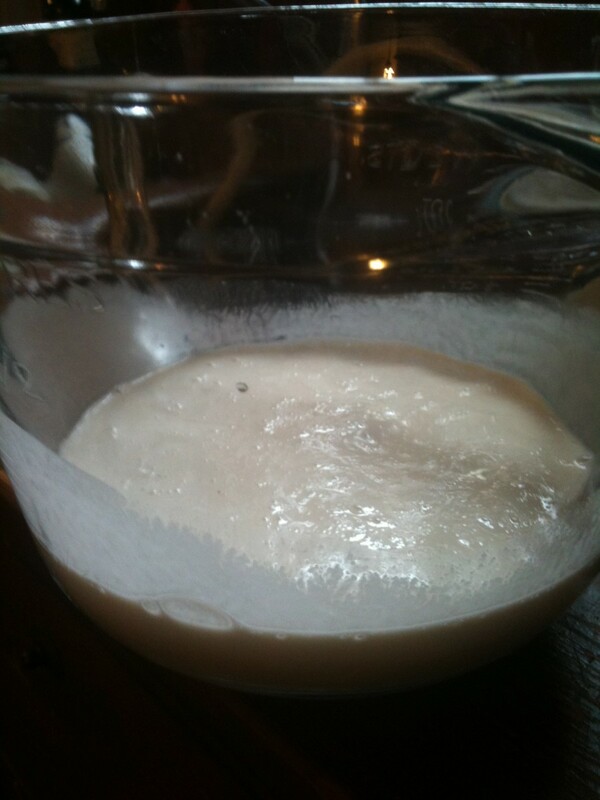 This is the 'proofing' stage - the yeast is getting ready to get to work. Watch for more bubbles and aroma. As soon as you have these, it's ready to become bread, but the longer it sits, the more distinct the 'sour' flavor will be in the final loaves. If you want bread in the evening, start your proofing in the morning, or if you want to bake in the morning, set it out overnight. 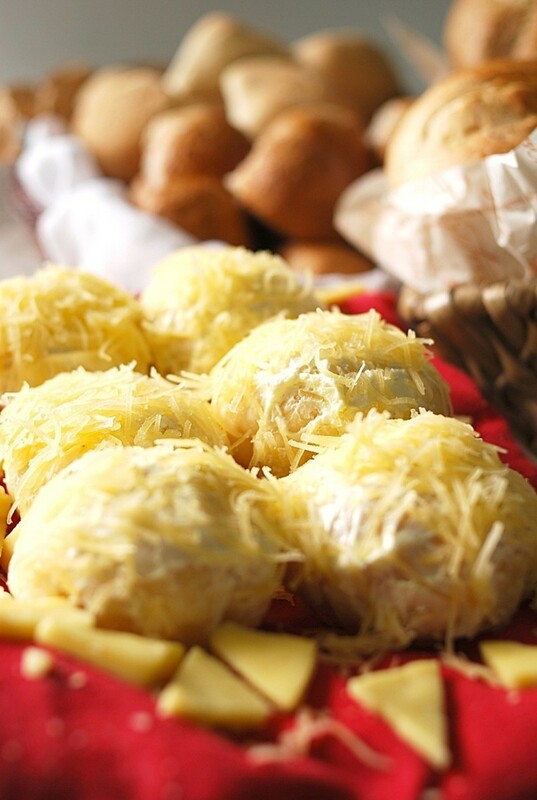 The actual minimum proofing time will vary - temperature, type of flour, water condition - all affect the proofing time. It shouldn't be more than six-eight hours at the longest, and can happen in an hour or two. Scrub the 'home' jar while you proof. Wait for bubbles and sour aroma. Ok? On to step three - the bread! The dough will be rough at first. If it doesn't come together after a minute add a tablespoon of water. 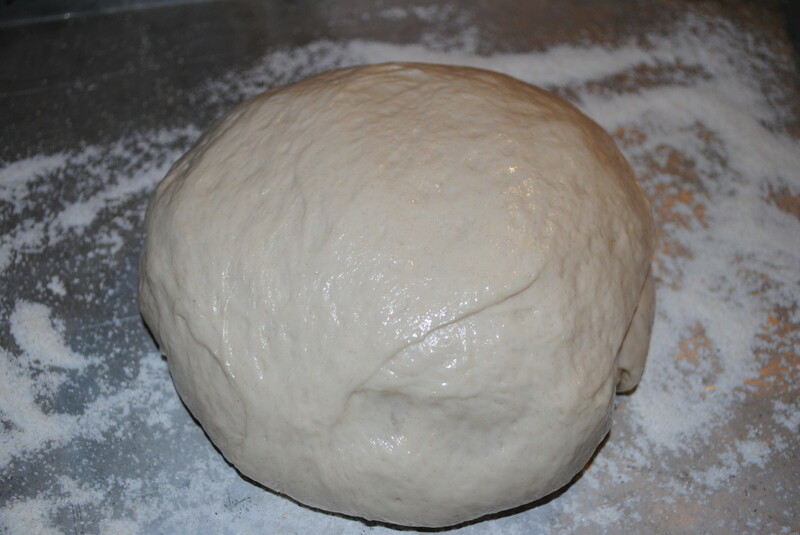 The dough goes into an oiled bowl to rise. 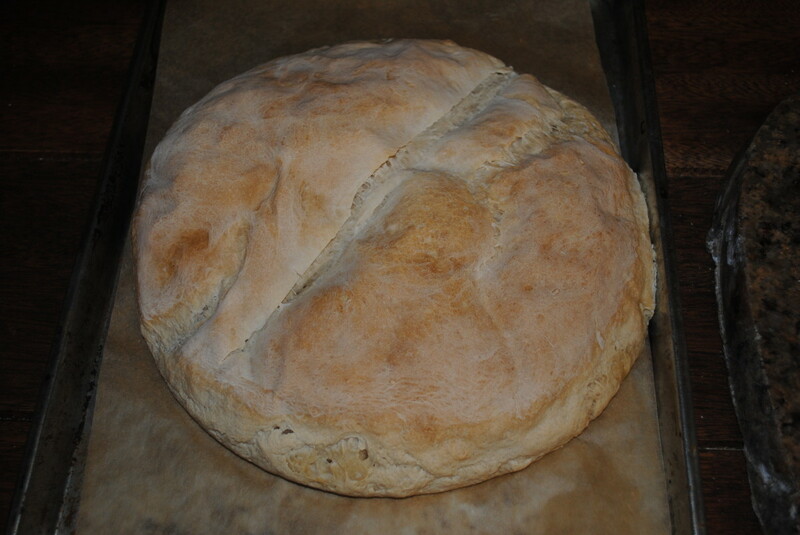 Once your bread has risen, punch it down, form it into a ball, and pop it onto a baking sheet. Making the Bread! Woo hoo! You've already got your sponge in a bowl - first thing to do is pour a cup of it back into its clean house. Feed it - 1/2 cup of flour and 1/2 cup of warm water. Stick a ventilated lid on it and pop it in the fridge. 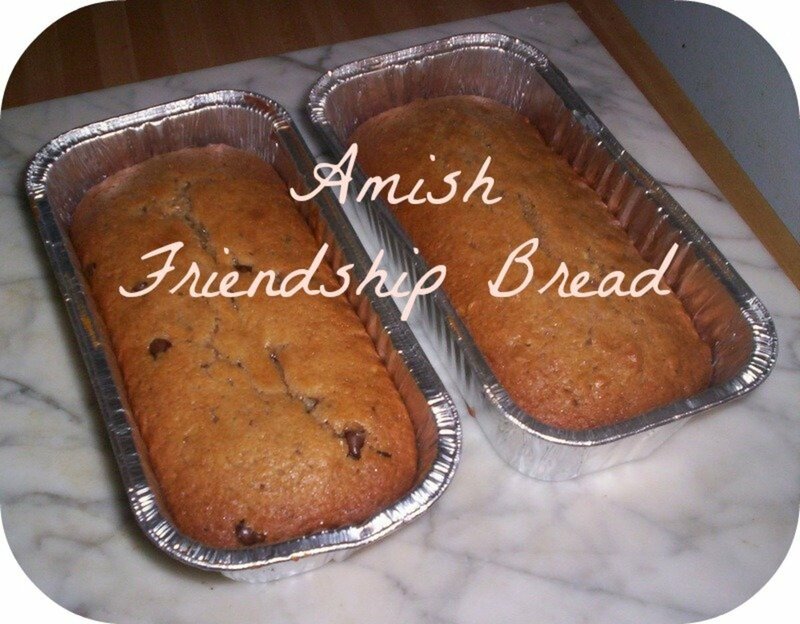 Your fairies will be ready to make bread for you next time you are. Don't forget to feed it at least once a week if you aren't using it often. 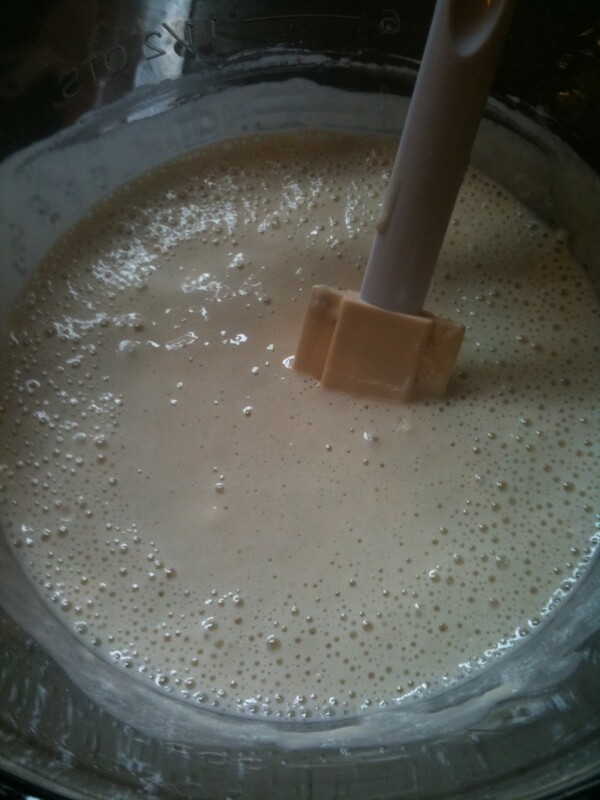 Pour the remainder of the sponge into a mixing bowl. From here you're pretty much going to follow many of the same steps as in making French bread. You'll only have one primary rise, but otherwise it's nearly identical. 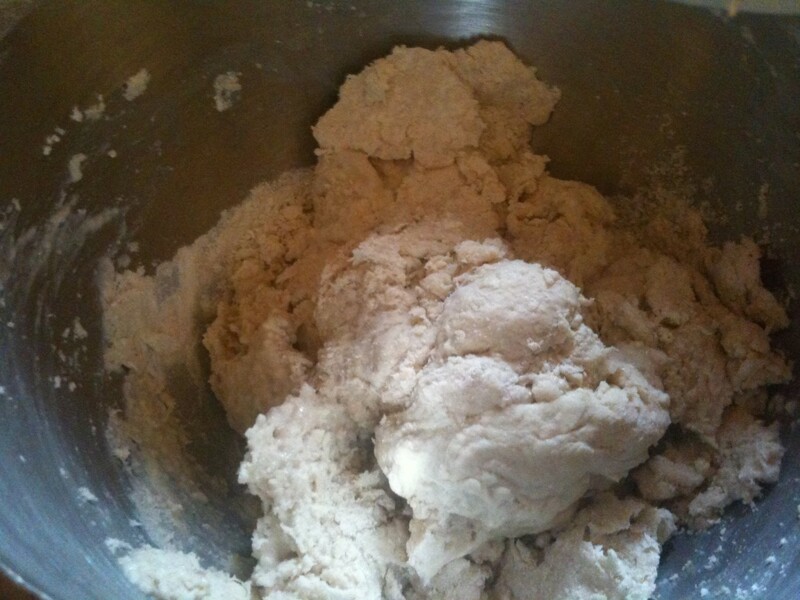 Start the dough hook on the mixer (you can always work by hand) and add the flour, about 1/2 - 3/4 cup at a time. Allow each batch of flour to mostly incorporate before adding more. Flour is variable - you can never be sure exactly how much moisture it will absorb, so you're looking for a texture in the dough, rather than in an exact amount to add. 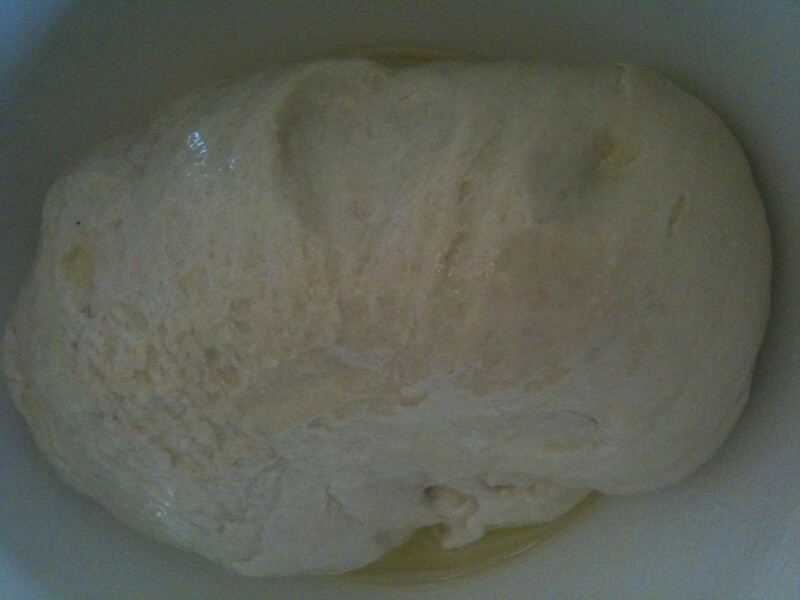 Continue adding flour, a little at a time, until you have a smooth and elastic dough. I showed this in the video links above. Once you've got a smooth dough, knead for about five minutes. Turn the kneaded dough into an oiled bowl (just rub a bit of oil inside a plastic or glass bowl), set it in a warm place and cover the top of the bowl with a tea towel or paper towel. You want it to approximately double in size. Now - this is part of the unknown nature of working with wild beasties - in my kitchen this rise took about four hours. It can take as little as one or two, or as many as six. See what happens the first time or two you make it in your own house. I've also noticed that it depends on the time of year - we've had a warm spell lately and mine has risen more quickly. Once doubled, punch down the dough, form it into a ball, and place it on a baking sheet lined with parchment paper. 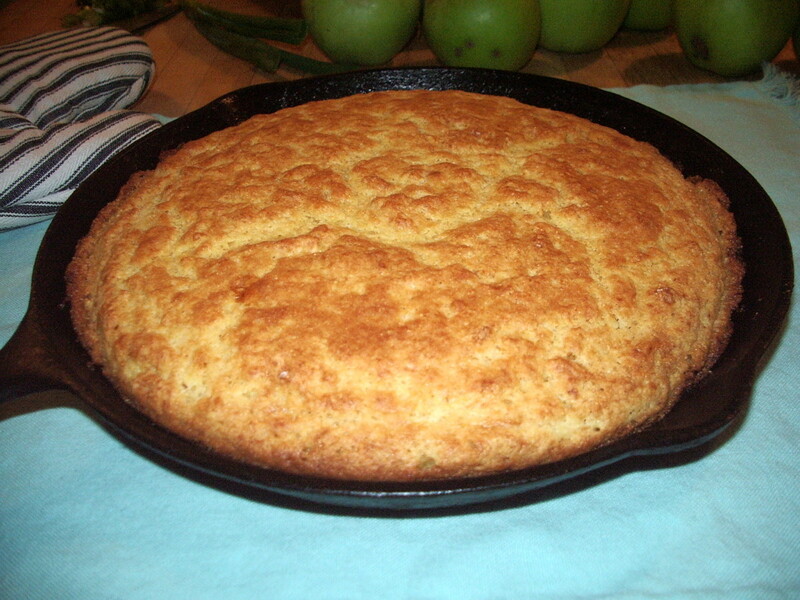 If you don't have parchment, sprinkle some cornmeal on the sheet. This just keeps the bread from sticking. Set it back in a warm place, cover it again, and again let it double in size. Now you do have some wiggle room with the timing here - I'm not going to show up to take measurements of your dough with my little calipers. But - if you forget it entirely and it rises too much - it will collapse on itself. I did this the other day - and baked it off to see what would happen. Ewww. Don't. Preheat the oven to 350F. 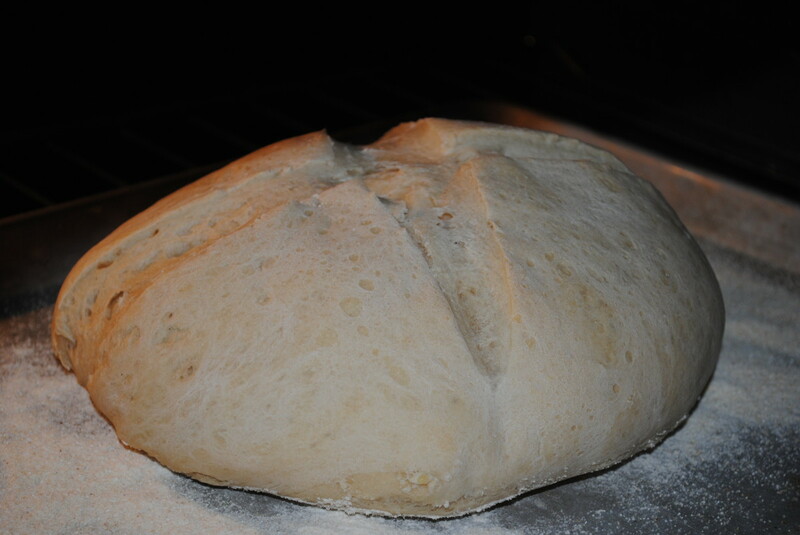 Once the dough has doubled, slash the top with a sharp knife. Either use a single slash for a traditional French Boule shape, or an 'x' because it's pretty. This allows the dough to expand while baking. Bake for about 30 minutes. The loaf will be brown and crusty, and when tapped will sound hollow. 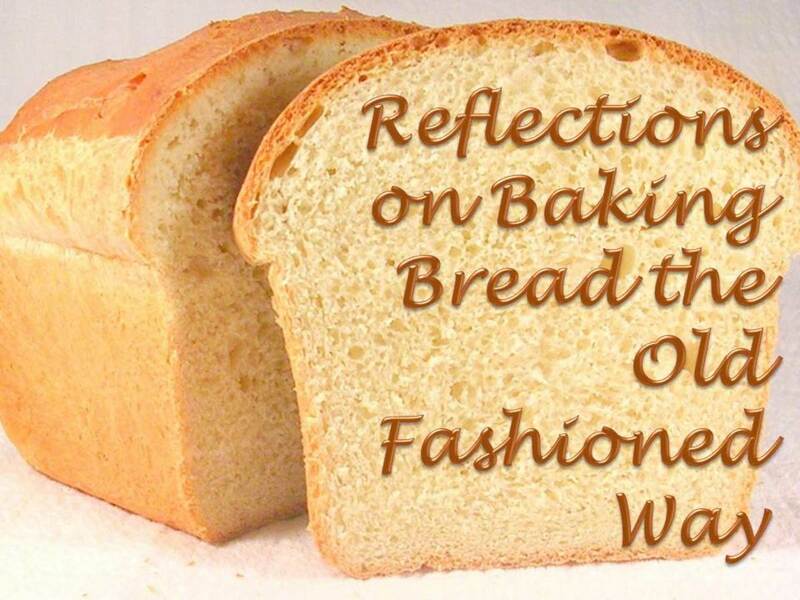 Allow the bread to cool on a wire rack (or the pan) for at least 15 minutes before cutting. It's fabulous warm, but it does need a few minutes. You'll get just a touch of carryover cooking as well. When slicing make sure to use a good bread knife - you don't want to squish the fire out the loaf you've just invested a good bit of effort into getting to rise. That's all there is to it. You're done. Play with it in your own kitchen. 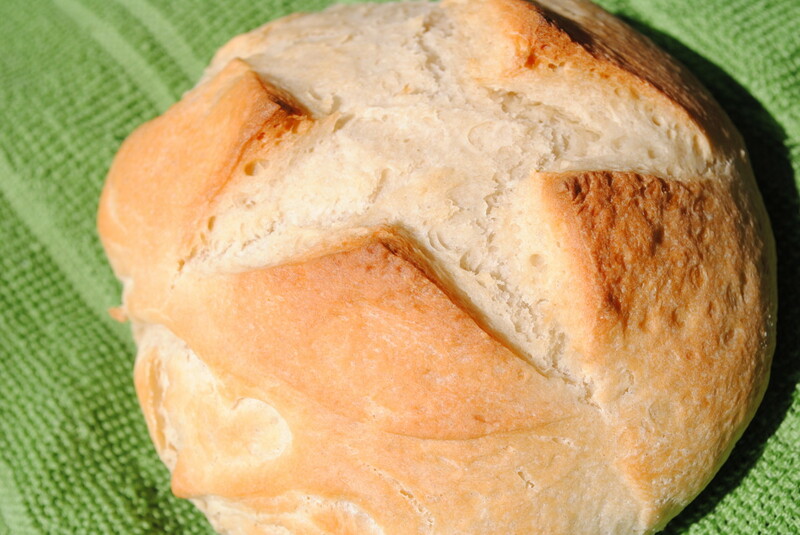 You'll love the viscerally satisfying aspect of making your own bread. And the food fairies will thank you. 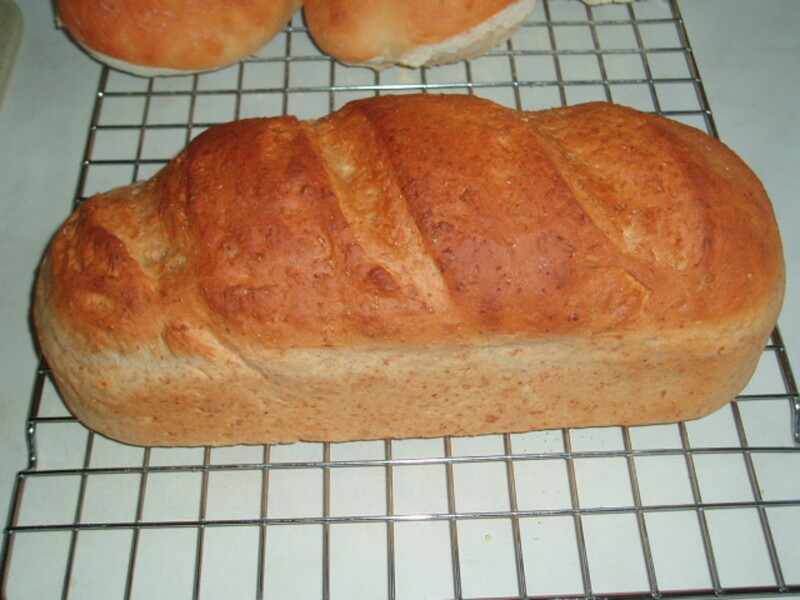 This loaf is partially baked - the slashes in the top allow for the loaf to expand correctly. Crusty golden brown! All done! Interior - dense and chewy. Don't do this! 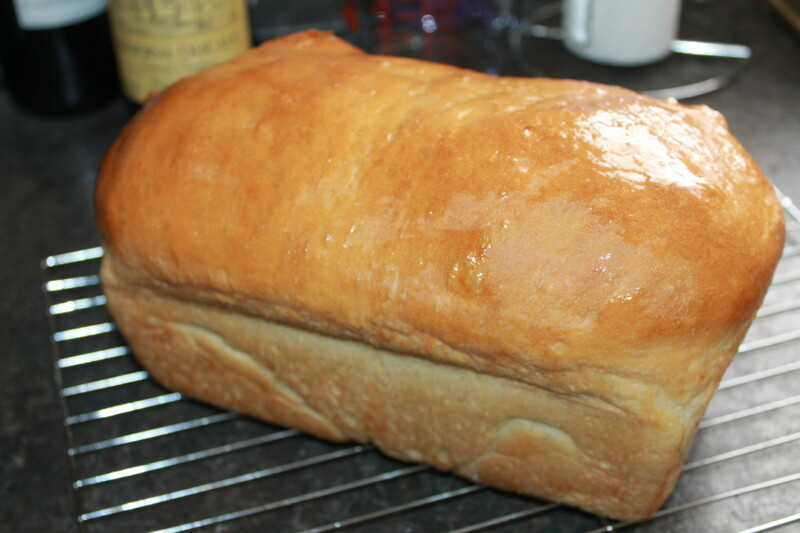 This loaf was allowed to rise TOO much - the structure collapsed. That absolutely made my day! I'm so glad! You know - that one is new to me. But it's not weird considering the nature of a sourdough started. I'd use it - following my nose. If it smells "yeasty and breast" that's what you want. The worst that'll happen is the waste of a few pennies of ingredients. Now if it's off at all - if it smells bad instead of bready or beery, then I'd toss it and start over. Different wild yeast species occur in differing regions and you may have caught a bad fairy. But chances are its fine if you started the culture correctly. I'd love to know what happens! new to bread baking but decided to try this. did as you said and started the proof. left overnight in oven with light on. by morning i saw the separated layer of liquid on top. by the time i got home from work atleast 1/2 of the contents had "boiled over" on the baking sheet I had the jar sitting on. Smelt the sour aroma but was shocked at how fast the process had happened. It had not even been 24 hours since i started the proof. Is this normal and ok? Should I just use the ~1cup i have left to start a loaf? It had a lot of the alcohol liquid on the bottom. Just now as you showed it. Just confused! Thanks for any help.